Have you ever wondered what you do all day? On average, I spend about 9 hours a day at work and I often switch between many tasks. At the end of the day I sometimes wonder about what I did! So, I was very interested when I found rescuetime the other day while surfing around on the web. Rescuetime promises to help you manage your time better by letting you track exactly what you are working on. They do this by have a little taskbar application that you download and run in the background. The application tracks your active windows during the day and sends the data to the RescueTime servers. They then summarize the data and turn it into into pretty little flash bargraphs. The graphs show a variety of data, almost every imaginable combination is shown. You can see how much time you spend using each application, you can check your time by application category, and you can view the percentage of time you spend at your computer per hour across a chosen interval. All this information is available by day, month, year or for all time. It is a pretty nifty tool, you can even configure alerts and goals to change your usage. Also, they encourage the use of their API to create new applications. 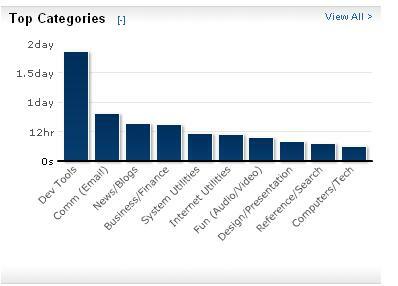 I’ve been using RescueTime for about a month now and I’ve noticed that my top 3 categories are ‘Dev Tools’, ‘Comm (Email)’, and ‘News/Blogs’. Now, using dev tools and e-mail are part of my job. However, ‘News/Blogs’ is pure web surfing! I counted up all the other categories and I noticed that I spent almost 20 hours in the past month online doing things other than work. Of course, some of these activites are off work hours and I often work extra so I don’t think the time spent is very worrisome. However, it is a siginficant drain on my productivity during the day since I constantly switch in and out of a browser window.